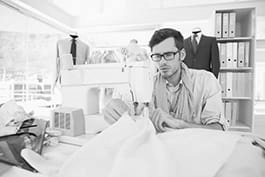 Sewers sew, join, reinforce and finish various manufactured items by hand and with sewing machines or equipment. Prepare for sewing, e.g. by folding, twisting, stretching or draping material, and securing articles. Measure and align the sewing work (e.g. parts, fasteners, trimmers) following seams, edges or markings on parts. Sew materials (e.g. to reinforce existing sewing, assemble pieces or a whole product) using different sewing techniques such as felling, tacking, embroidery, etc. Smooth seams, e.g. using heated irons, flat bones or rubbing sticks. Trim excess threads or edges of parts, e.g. using scissors or knives. Sew buttonholes and attach buttons, zippers, pockets, collars, trimmings, etc. Examine sections of finished articles for defects. Carry out basic maintenance of sewing tools and machines.